Wictor is an honest and effective writer who has essentially offered himself up for complete dissection. For more than a decade, music critic Thomas Wictor led a tortured life. By day, he suffered from paranoid delusions, career troubles, physical problems, hallucinations, the collective traumas of invasive therapists, his father’s death, and an emotionally crippling relationship. Sleep offered him no respite from the pain; dreams, often nightmares, tormented him. Hallucinabulia: the Dream Diary of an Unintended Solitarian is part memoir, part dream journal, chronicling the suffering and eventual liberation of a wildly imaginative and hurting mind. Each chapter begins with an autobiographical snippet, most of which could have been a bit longer and more in-depth, outlining a particular diagnosis or difficulty Wictor faced. These sections serve as an introduction to a series of dreams and nightmares that follows. The dreams range from familiar themes (such as teeth suddenly falling out or unexpected nakedness) to nonsensical surrealism, with more than a few seriously horrifying scenarios. Wictor’s voice undergoes an interesting shift between these sections. In the real-life portion, he writes with passion and color. In the dream section, he takes a step back and relates the dreams as if he were an observer, no matter how disturbing, strange, or funny they may be. This is not to say his dream descriptions are presented without feeling or personality, but he does not editorialize or analyze during the dreams. The dichotomy of voicing emotion about his daily troubles and matter-of-fact reporting of phantasmagoria imparts Hallucinabulia with a profound sense of sincerity and credibility. In the hands of a less talented writer, the very notion of publishing a dream journal could evoke mild curiosity at best and, at worst, could come across as an act of pure narcissistic indulgence. Wictor, however, succeeds at maintaining relevance. The dreams are symptoms of the psychiatric, physiological, and neurological hardships he faced; the book is, ultimately, a journal of the difficulties of navigating emotional pains and hopes manifested in dreams. Hallucinabulia has a lot going for it. The writing is solid, the subject is presented sincerely, and the volume is well organized. If anything, the biggest problem is simply marketability. The author, despite experience in music journalism, is not well known, and that’s a problem—though not insurmountable—for a memoir. If the title were more evocative, that would help, but instead it’s an unfamiliar word. 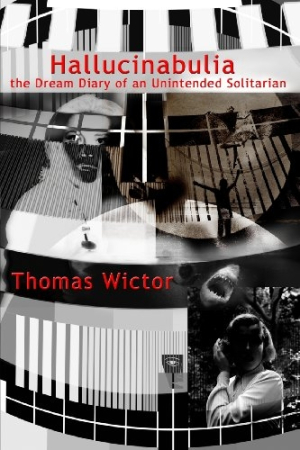 The suffix abulia, Wictor tells us, means a “deficiency of will” and “reduction in speech, movement, thought, and emotional reaction.” This doesn’t really invite any particular immediate image, though the subtitle, the Dream Diary of an Unintended Solitarian, helps clarify the subject of the book. Those who get past the obscurity and peculiar title will find some fascinating material. Wictor is an honest and effective writer who has essentially offered himself up for complete dissection. His dreams range from comically nonsensical to utterly terrifying, with plenty of strangeness and, occasionally, joy, in between.